Building relationships with fellow florists helps make the industry stronger. Have a great experience with a fellow florist through FSN? You can easily mark that florist as your preferred florist for that sending area! For times when you or your customer do not have a satisfactory experience with a receiving florist you can mark that florist as Do Not Send and we will choose a different florist to fill orders in that area. 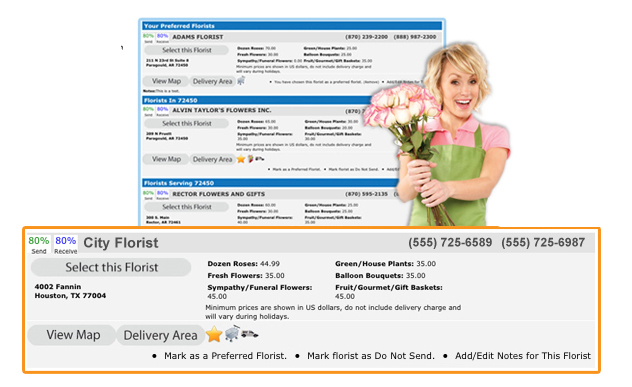 See sending and receiving rates, plus minimum prices for common products at a glance for each florist. There are also icons that let you know things like if they confirm deliveries or have an FSN Selection Guide. Add your own notes to any florists in our sending network to remember them the way you want. We frequently get asked who we use for sending out flowers and we are proud to say we are members of the Flower Shop Network. They only use local flower shops, and you can find one yourself on their website. Check it out and look us up on there as well. We have been very pleased with the shops they use and they have great customer service. And of course the shops that use us are happy too! — Frank B., Best Wishes Floral in Golden Valley, MN. Make fellow florists take notice when sending florist to florist orders with a colorful, enhanced listing. Your colorful listing will appear in your resident city and the additional cities and zips you serve, above standard listings for that area. for special pricing or for more information. F2F Select Ads in resident cities appear above regular resident city ads as a group and randomly rotate within the select ads appearing. F2F Select Ads in non-resident cities appear below all resident city ads, but above regular non-resident ads and randomly rotate within the select ads appearing.